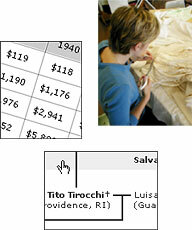 What would the price of a Tirocchi garment or alteration be in today's dollars? Conservationsists at the University of Rhode Island prepare the garments for display in the RISD Museum. See three generations of the Tirocchi lineage and track the family's migration from Guarcino to Providence.